The outer part of the upper leaf has a wind rose with 32 directions and compass viewing hole. The spandrel spaces are decorated with flowers in red and green and have cast gilt brass plates as feet. The inner part of the upper leaf has two pin gnomon dials: the one on the left is for the length of the day (numbered in red from 8 to 16) and the declination of the sun. The one on the right indicates unequal hours numbered (incorrectly) from 4 to 12 to 8. The inscriptions read respectively 'QVANTIDASS DIEI' and 'PLONETEN STVNT' and enclose two feeding birds. In the middle are holes for adjusting the string for latitudes 54?, 48?, 42? and below, a table of latitudes. According to P. Gouk, the cities given for latitude 54? are incorrect even by contemporary standards. The inner part of the lower leaf has a string gnomon dial for common hours numbered from 4 to 12 to 8 and IIII to XII to VIII and again 4 to 12 to 8, in concentric circles for the latitudes above mentioned, with dots for the half hours. The inscription reads 'POLLVS HO'. 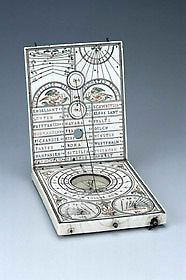 The compass indicates 'S', 'M', 'ORIENS' and 'OCCI DENS' and a fleur-de-lis indicates north. Below are two pin gnomon dials for Italian hours (inscribed 'P 51 G' and 'WELSCHE VHR' and numbered from 9 to 23) and Nuremberg hours (inscribed 'P 49 G' and 'NIRENPERGER VHR' and numbered from 1 to 15). Foliate decoration fills the remaining space. The outer part of the lower leaf has a combined lunar volvelle with the phases of the moon and a table of epacts ('incorrect', i.e. it starts with 17 / 7 instead of 28 / 8 and the terms 'Julian' and 'Gregorian' are reversed). The same motif of flowers and brass spandrels as in the other outer face is repeated.